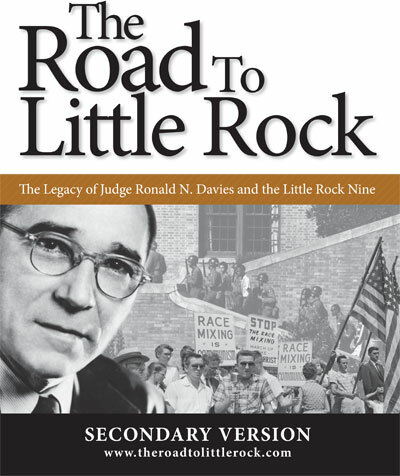 The Road to Little Rock is an award-winning thirty-minute documentary that vividly showcases not only the oppressive nature of American racial segregation, but also the spirit and determination of nine children who, in the face of such adversity, sought enrollment at Little Rock’s Central High School in 1957. It also unearths the courageous story of Judge Ronald Davies who, against entrenched opposition, sided with those students and demanded the school district’s integration. The documentary, which features never before seen interviews with those students, along with Supreme Court Justice Stephen Breyer and other witnesses and experts, is a microcosm of the larger American Civil Rights Movement. As such, it is an invaluable teaching tool. The Road to Little Rock curriculum guide, aligned to the Common Core and individual state standards, is endorsed by the National Endowment for the Humanities, and Arkansas and North Dakota Humanities Councils. Both the elementary and secondary curricula ask students to think critically about social, political, cultural, constitutional, moral and ethical dimensions of the civil rights struggle. Detailed lesson plans ask students to analyze political cartoons, letters, photographs, court statements, memoranda and other primary sources in order to interpret the Little Rock students’ actions, the ruling of Judge Davies, and the wider scope of racism in America. The curriculum also provides rich opportunities for interdisciplinary instruction and learning differentiation. The elementary school version breaks the film up into four segments that are easily teachable and that help younger students grasp key concepts and vocabulary words. The Road to Little Rock shines a bright light onto the history of the Civil Rights Movement and reinforces the notion that individual actions can forever alter the fabric of American democracy. For more information or to provide feedback, please send us an email.